Journalists, NGO representatives, scholars and others came Monday to the WTO in Geneva to watch the proceedings of a Dispute Settlement Panel. It is the first time ever a legal proceeding is open for public viewing at the World Trade Organization. 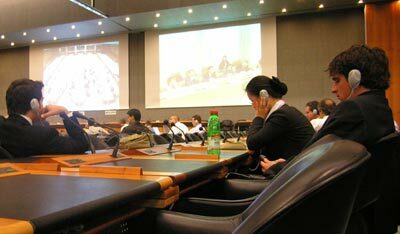 The public watched the proceedings from a separate room at the WTO headquarters, via closed-circuit broadcast. The decision was taken by the members of the dispute settlement panel after a request from the parties: Canada, European Communities, United States. Ambassador Don Stephenson of Canada said that “the closed process leaves the public, even parliamentarians and interested non-governmental organizations to imagine the worst of the process, and to question its legitimacy”. He added that “countries presenting reasoned arguments before impartial judges and under international law...is something that should be celebrated, not hidden away”. Mr. David Shark of the United States said that his country “has been seeking open panel meetings for quite some time and at each panel meeting or proceeding that we have participated in, we have proposed this to our fellow disputants”. “We are particularly pleased that the panel itself has taken the decision to open the meeting to the public,” he said. Mr. Fabian Delcros of the European Communities said it was important that the public and interested organizations “see that the WTO procedures are objective, impartial and professional”. He added that it was also important for interested WTO members to be in a position “to simply come here, take note, and see for themselves what's happening”. The proceedings for this meeting of the panel are scheduled to go until 15 September, and they are part of the case “Continued suspension of obligations in the EC — hormones dispute” a dispute brought by the EC against Canada and the US. The panel stage of dispute settlement cases normally takes from six to nine months to complete.